First Ebola Vaccine Likely To Stop The Next Outbreak : Goats and Soda The results are in from the clinical trials of a new vaccine — and it looks like a potent weapon. In fact, they are already stockpiling it. When Ebola struck West Africa a few years ago, the world was defenseless. There was no cure. No vaccine. And the result was catastrophic: More than 11,000 people died. Nearly 30,000 were infected. Now it looks like such a large outbreak is unlikely to ever happen again. Ever. The world now has a potent weapon against Ebola: a vaccine that brings outbreaks to a screeching halt, scientists report Thursday in The Lancet. "We were able to estimate the efficacy of the vaccine as being 100 percent in a trial," says Ira Longini, a biostatistician at the University of Florida, who helped test the vaccine. "It's very unusual to have a vaccine that protects people perfectly." Now, no vaccine — or drug for that matter — is perfect. The efficacy of the vaccine is clearly high but not "100 percent." That value reflects the fact that they just haven't tested the vaccine on enough people yet. So it is likely to decrease as the vaccine is used over time. In the end, the efficacy is likely to sit somewhere between about 70 percent and 100 percent, Longini says. By comparison, the flu vaccine last year was about 50 percent effective. And the Ebola vaccine works lightning fast, within four or five days, he says. So it could even be given after a person is exposed to Ebola but hasn't yet developed the disease. Longini and his colleagues tested the vaccine on about 4,000 people in Guinea back in 2015, when Ebola was still spreading there. These people were at high risk of getting Ebola because they had had contact with someone who was infected. When they got the vaccine right away, they were completely protected. No one got sick. The vaccine — called rVSV-ZEBOV — hasn't been approved yet by either the World Health Organization or the U.S. Food and Drug Administration. That's predicted to happen sometime in 2018. And there are still a few open questions about the vaccine, says Dr. Anthony Fauci, at the National Institutes of Health. "For example, we don't know how durable the vaccine is," he says. "If you give health care workers the vaccine, for example, how long would they be protected? That's very important to learn." What is clear is that the vaccine offers short-term protection during outbreaks. And that's exactly what's needed to stop the virus from spreading and to keep small outbreaks from getting out of control. For this reason, GAVI — the Global Alliance for Vaccines and Immunization — has already spent $5 million to help finish the development of the vaccine and to stockpile it. "So we have made 300,000 doses available, as of earlier this year, if there was to be sort of any resurgence or any kind of emergency," says Swati Gupta at Merck, which is manufacturing the shot. Vaccines typically take years, even a decade to test. But the field trials for this one took less than two years. "It's been a pretty tremendous experience," Gupta says. "There's been a lot of international partners that have come together in a real unprecedented effort." 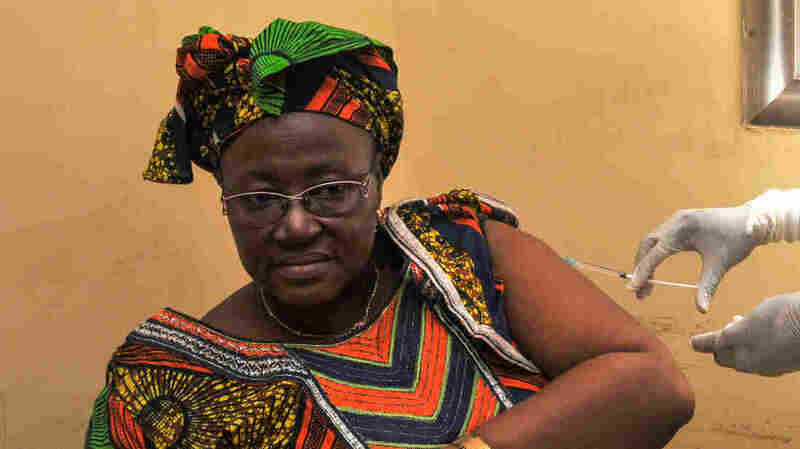 The magnitude of the outbreak in West Africa, she says, made companies, governments and academic institutions push aside their own research agendas to come together and finish a vaccine.